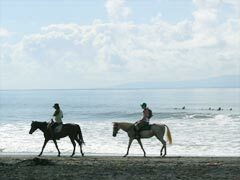 Bali Activity Saba Beach, the north of Sanur is the place of Horse Riding which managed by Ayun River Rafting Corporation. 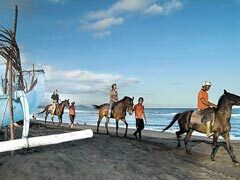 You can enjoy take 1.5 hour walking while riding the Hourse. This is very fun ! From check in point, we go toward the Saba Beach walking along green trail. 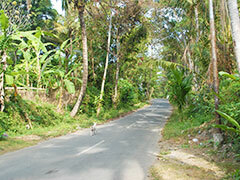 Take a unique look at this seaside village as you pass the Pura Segara Wilis temple before heading out onto the wide sandy beach. * Not available for guest Age under 4. * The weight limit is 90kg for both single and double rides. 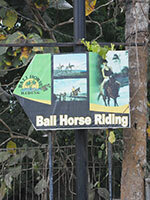 * The 12 horses are available all horses can ride 2 persons. * The course or time might be shorter due to the weather and the tide. 5．Taking break at half point. Drink paid by customer. 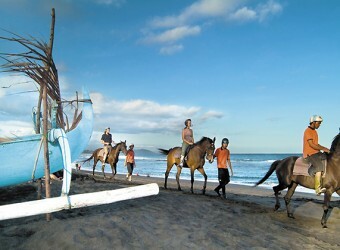 It takes one hour from Kuta to Horse Riding. 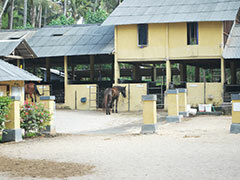 There is a horse house at the back of parking. 22 horse living here. It can riding over 5 years old. 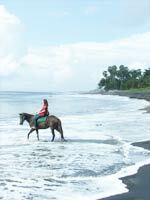 In the distance is Nusa Penida Island and great volcano Gunung Agung. 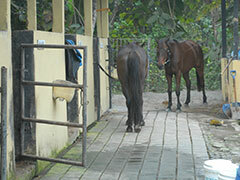 If you first time riding, your guide walking and rein in a horse. 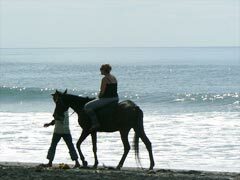 If you have experience, you and guide riding 2 horses and can running freely. 3 times 1 day(Morning/Middle Day/Afternoon). It takes about 6 hours. There are 12 horses for riding. The weight limit is 90kg for both single and double rides. Change of clothes, shoes, long pants, bathers and towel, Sunscreen, charge of drink is recommended. If you want to use pool, please bring swimwear. I felt very good to ride on the back of horse. I could fully enjoy the beautiful view of green nature and the sea. 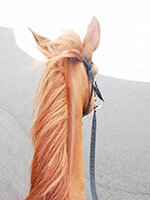 It was the third time for me to enjoy horse riding. Enjoyed riding with my family. I was worried about my 10 year old child. But I was happy that my child can ride a horse without problems. My child was also very glad. It was hot during a day, so I enjoyed riding at sunset time.